The only comprehensive historical analysis of the globalization of the U.S. apparel industry, this book focuses on the reemergence of sweatshops in the United States and the growth of new ones abroad. 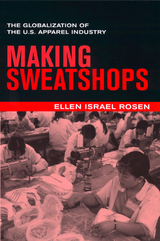 Ellen Israel Rosen, who has spent more than a decade investigating the problems of America's domestic apparel workers, now probes the shifts in trade policy and global economics that have spawned momentous changes in the international apparel and textile trade. Making Sweatshops asks whether the process of globalization can be promoted in ways that blend industrialization and economic development in both poor and rich countries with concerns for social and economic justice—especially for the women who toil in the industry's low-wage sites around the world. Rosen looks closely at the role trade policy has played in globalization in this industry. She traces the history of current policies toward the textile and apparel trade to cold war politics and the reconstruction of the Pacific Rim economies after World War II. Her narrative takes us through the rise of protectionism and the subsequent dismantling of trade protection during the Reagan era to the passage of NAFTA and the continued push for trade accords through the WTO. Going beyond purely economic factors, this valuable study elaborates the full historical and political context in which the globalization of textiles and apparel has taken place. Rosen takes a critical look at the promises of prosperity, both in the U.S. and in developing countries, made by advocates for the global expansion of these industries. She offers evidence to suggest that this process may inevitably create new and more extreme forms of poverty. Ellen Israel Rosen is Resident Scholar at the Women's Studies Research Center at Brandeis University and author of Bitter Choices: Blue-Collar Women In and Out of Work (1987). 12. The New Global Apparel Trade: Who Wins, Who Loses?